If you’re like me, you had the opportunity to take in at least one 4th of July fireworks show over the weekend. I love the fireworks and everything that goes with them…the sights, the sounds, the smells and the crowd reactions. This year, I found myself thinking about how the organizers are able to delight the crowd year after year. No matter what, there are always ooohs and ahhhhhs, cheering and horns honking. The visitors always go home happy…maybe a little hard of hearing…but happy. Wouldn’t it be great if prospects were that happy every time they visited your website or consumed your content? Of course, part of the reason people are delighted by fireworks is that they aren’t an every day occurrence and they’re not inundated with them like they are content. That’s why it is even more important that marketers find a way to create content that is able to stand out and make some noise – like fireworks - to their target audience. As I thought about it, I realized that effective content and a great fireworks show do have some things in common. 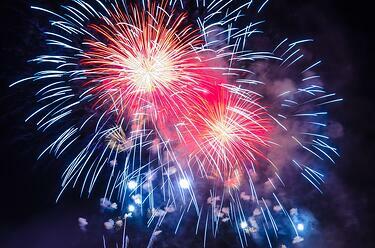 Here are three things marketers can learn from a fireworks show that will help them in content creation. When people go to the fireworks, they have an expectation of what they are going to see. They expect explosions, a lot of noise, beautiful colors, a variety in types, cheering crowds, maybe some music and possibly a sore neck. When your prospects visit your website and/or download a piece of content, they also have expectations. Chances are they are seeking information. They’re trying to learn something. They expect your website to be easy to navigate and your content to be useful. If you're clear on who your buyer personas are, then living up to their expectations shouldn’t be that hard. If you know them as well as or better than you know yourself, then you know what they’re expecting from you. Be sure to define and document your personas. If you have, then review them and refresh if necessary. Remember, they’re meant to be a living, breathing part of your demand generation strategy. If you give them what they came to see, chances are you’ll make them as happy as a fireworks crowd. I’ve been to more fireworks shows than I can remember. Some years, depending on schedules, we see multiple shows. You’d think that I’d be getting bored. After all, fireworks are fireworks, right? That’s the thing. Fireworks are fireworks but every year they add something new and different. Things I’ve never seen before. This year, it was new ground fireworks that went off in a wave of motion and color. They also added a gentle fountain that I had not seen and fireworks that included every color of the rainbow – in one. When prospects consume content, they’re looking to learn things they didn’t already know or to get a fresh spin on an old problem. Create content that provides that for them by creating a list of questions they are asking. Build your editorial calendar and premium content around answering those questions. Frame problems in new ways and provoke thoughts and questions they may not have considered. Mix up your content types too. Use an infographic instead of a whitepaper to answer a question. Instead of always writing your case studies, use video instead. Or how about engaging them with a survey? I may not be in the norm but I’ve never gone to a fireworks show and wished it would be over sooner. In fact, I can always stay for just one more weeping willow or crackly fountain. Wouldn’t it be awesome if your prospects never wanted to leave your site or couldn’t wait to read your next piece of content? Or what if they started sending you messages to find out when you’d be publishing another blog post? Sounds like some kind of crazy marketer dream, doesn’t it? You’re probably thinking that could never happen but the truth is, it can and it does. If your content is truly helpful and is also engaging, why wouldn’t your prospects want more? The first step to creating such an environment is developing an understanding of the buyer’s journey. If you know how your prospects progress through the journey, you can create content that guides them through each stage and then onto the next. A content map is useful tool that will help you keep track of your content and how and where it applies to the buyer’s journey. When you woke up this morning to head back to work you probably weren’t trying to figure out what you could apply to your day from the fireworks show. I’m glad I could make the connection for you. Hope you had a fun and happy 4th of July!